I was blessed with the opportunity to be an artist of a wall mural in Daphne, AL. Murals are going up all over the downtown block of this cute little town in Baldwin County Alabama (just north of where I live). There are paintings depicting the town’s boating and the farming culture, an old scene of Main Street, the Magnolia girls well-known for attending functions as Ambassadors of the Mobile area, and family members of original Daphne families. 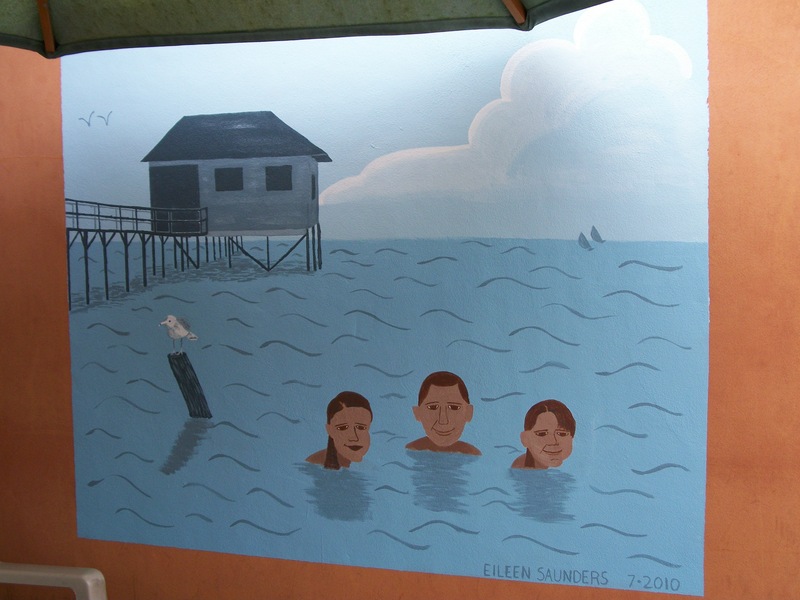 That’s where I came in…I painted (from a photograph) a picture of Mr. Manci (owner of Manci’s Antique Club) as a child with his sisters swimming in Mobile Bay. The mural is on one of the walls surrounding the restaurant’s patio dining area. If you’re a foodie, you’ll remember the restaurant from one of Guy Fieri’s episodes of Diners Drive-Ins and Dives. My wall mural in Daphne Alabama. A table umbrella is casting a shadow on a sunny cloud. The artist selection committee included the mother of a friend of mine. We were all chatting one evening when my friend changed the subject and said, “You know, mom, Eileen can paint.” I was recruited from that moment and I’m thankful. It was a lot of fun to do. If you get to Daphne please check out all of the wall mural art in town. Some amazingly talented people have worked on this project including students from two local schools, graduate art students, seasoned artists and me. I teach a Nature Journaling class from my home. My students, who range in age from 7-15 so far, receive a journal and #2 pencil to get them started. I like to use a Strathmore 300 series, 5×8 notebook with the spiral down the side. There are plenty of pages, the paper is great and the size is just right for a small tote or backpack. When they get hooked on it, they can purchase what ever extras they want: color pencils, a variety of B and H pencils, charcoal pencils, various erasers and sharpeners. Everyone has their own level of supply needs; I furnish the basics to get them started but they can borrow any of my art supplies during class to try out. We spend the first day talking about what a journal is, compare samples of my old journals and a page or two from some else’s published journal. These other journals can be Lewis and Clark’s, Audubon’s, or any other journal you might find in the library. I go over a list of supplies for a backpack if you should want to go out away from the comforts of home and sketch in the field. I like my students to have this list in the back of their journal, so we take time to write it in. Then we head out in my yard with field guides, binoculars, journals and pencils to start our books. If you just sit and watch, and then sit with your eyes closed and listen, and then take a deep breath through your nose, you can experience so much of your surroundings in a short amount of time. We did this exercise each day to start and then we wrote. I am always amazed by what is written and the way it’s written. The same observation of a bird singing in a crepe myrtle just a few feet away is revealed so differently from one person to another. I enjoy my student’s writing. Then we draw. I can be anything: the bird we heard, the mosquito that bit someone on the arm while we sat outside, the ant carrying a pretty big piece of something across the patio. Field guides are great for this exercise. I teach them to gesture sketch and quick sketch things that will move. Then use the field guides to work on details. For the rest of the week we take field trips. Last week we went to 5 Rivers and the Fairhope Pier among other places of interest. I haven’t planned out next week’s trips yet; weather is a factor but we’ll probably go back to 5 Rivers. Journaling is a great creative outlet for anyone. It is a little bit of art and a little bit of journalism. It’s making scientific observations or an accidental discovery. A journal page could be scattered with seemingly random pictures and a few words describing them. It could also be a lengthy story of how last week you didn’t think spring would ever come because the trees were so bare and suddenly, in what seemed like a flash of time, everything is covered in green. I’ve written about how I watched fish crows dive into mockingbird nests and carry off a nestling while being chased by the parents. I’ve written about the oil spill and drew before and after pictures of the beach. I’ve drawn the creatures that inhabit my fish tank and follow it with a paragraph describing each. A nature journal can be anything you want it to be. I get emails from the folks in Manatee County FL listing their nature tours and events. One email struck me as especially cool. They were looking for naturalists in the area who had kept journals chronicling various nature events. What a cool thing, I thought, to be able to assist in the study of our natural surroundings. Perhaps you have kept track of when your magnolia trees bloom each year, or what the temperature is each night the crickets are deafening, or what date the wooly caterpillars make an appearance in your neighborhood. Maybe you won’t get published in a major scientific journal, but your grandkids could enjoy knowing what the environment was like when you were a kid. In my back yard, by the corner of my house, is a rather tall, skinny crepe myrtle. A couple of yards away is a double shepard’s crook with a hanging finch sock and a caged bird feeder filled with songbird mix of sunflower seeds, nuts and berries. Sandwiched between is a smaller single shepard’s crook from which I hang a hummingbird feeder. A male cardinal and his fledgling lighted on a branch of the crepe myrtle. The young clung to the branch fluttering its wings while Dad snatched a snack at the feeder. He flew it back to the branch and fed his child. Returning to the feeder, he did this several times. Then, leaving the young on the branch, the he hopped around my yard and finally poked into the ground retrieving another morsel for the baby. I watched as he fed it to his child. How often do we get the chance, and take the opportunity, to watch birds parent their children? Shortly after we had moved to Mississippi for the second time, we had heard that the Ivory Billed Woodpecker (IBWO) was spotted in Arkansas. Thought to be extinct, this was a major find. I had not yet been hooked on birding. I had just started homeschooling and it took a science book, “Exploring Creation with Zoology I: Flying Creatures of the Fifth Day”, to get me immersed in this fun hobby. Since that day in the news, I’ve found and read many books and articles about the IBWO. I’m currently reading ” The Race to Save the Lord God Bird” by Phillip Hoose. Others worth reading include: “The Grail Bird: The Rediscovery of the Ivory Billed Woodpecker” by Tim Gallagher, and “Stalking the Ghostbird: The Ellusive Ivory Billed Woodpecker in Louisiana” by Michael K. Steinberg. One other book I’ve read is “In Search of the Ivory Billed Woodpecker” by Jerome A. Jackson. All were great reads and held my attention. If only I could find one. A southern bird, it’s been hunted for it’s large head and ivory bill. I understand that there is documentation of Native American Indian Chiefs wearing belts or necklaces of the IBWO’s head and bill. Hunters sold them for good luck charms or to wear as jewelry to the Northerners who had never seen anything like it. The huge feathers adorned fashionable hats. The habitat was destroyed which helped in its demise. Frontier towns sprang up on previously thickly forested areas, and rebuilding Chicago after the Great Fire caused a major shortage of lumber east of the Mississippi. Then there was the Civil War; years after the restoration of the south when land was available for purchase, forests were cut down in, what seemed like a day, as people from the North and Midwest desired the lumber for homes and other buildings. Without the thick forests and swamp lands, the Ivory Billed Woodpecker was prime target for hunters. Even naturalists, like John Audubon, had to kill a few for paintings, science study and museum displays around the country. No wonder the bird was thought extinct. There are several sites on the internet where you can learn more about the IBWO and report a sighting. My favorites include www.ibwo.org, http://www.fws.gov/ivorybill/, and http://www.birds.cornell.edu/ivory/. If you spot one, be sure to let me know as well. We are official oyster gardeners. The boys and I picked up a bag of oysters for the oyster gardening project this morning. Five other families have joined us to care for 50 shells covered in spawned oysters until November. These families are: Biggs, Williams, Huete, Seaborg, and Grant. All of the families are members of 4H and the children are homeschooled. This is a science/4H project to teach the children (ages 5 through 16) about our eco-system by learning one part of it and relating the importance of the part to the whole. Our cages are hanging from a pier just north of the CR1 boat ramp. What a lovely area on the Mobile Bay and easy to get to. Each week we will be checking the oysters and cleaning them of barnacles, drills and crabs. We have to take growth measurements and report them to the folks at the Mobile Bay Oyster Gardening Program. This is basically a reef-restoration project we are involved in. By November the oysters go to a non-commercial reef in the Bay to help keep the water clean. We need it with the oil off our coast. Check out how you might help http://www.oystergardening.org and please keep us in your prayers. We all looked at each other and broke out in laughter. What if deep water oil drilling had been allowed in the ocean near a little imaginary community of sea critters and one land mammal threatening to destroy their lifestyle? We imagined that a little yellow guy, who looks more like a rectangle than a square, would offer up, in a heroic yet childish way, his life to save the town. Since he can, he’d soak up the oil, float to the top of the ocean and wring himself out into an oil tanker waiting above, then dive down to do it all over again. Maybe he’d recruit his relatives. And, we decided, if he started early enough after the oil started spewing into the water, that he could keep all of it from reaching the nearby coasts, thus saving the world. Too bad it’s just fiction. Sponges are real, though, and live in the Gulf of Mexico right along the western Florida coast. We had been to Tarpon Springs, FL this summer. Named the Sponge Capital of the U.S., Tarpon Springs is a wonderful little Greek town that thrives on both fishing and the sponge harvest in the nearby waters and tourism. I bought a large vase sponge to add to my collection of marine specimens. Appalachiacola is another sponge harvesting community along the Gulf. They have a sponge museum called the Sponge Exchange. Unfortunately, if the tar balls and oil reach these communities and the sponges in the water, there isn’t a single thing these critters can do. Sponges are not mobile and cannot, therefore, run away from the toxic goo. They’re stuck. They may survive; they may die. I haven’t found a source yet that says for sure what will happen to sponges in the Gulf of Mexico. It’s hard to tell, also, whether the oil will even make it to Florida’s west coast. From what I’ve read, the Loop Current is too far away to pull the oil to the beaches, but it is hurricane season and tar balls were just found in Texas. I’m devastated by this. Our whole life here on the northern Gulf coast is changed. Jobs are lost or in peril. The spill has affected not just the people who work in tourism, or some kind of water related business but also inland businesses including museums, restaurants and yes, professional and collegiate sports. I read that a facility that hires mentally handicapped people to fold towels for the hotels along the coast is out of work…no tourists, no towels or linens to fold. Tithing is down in some churches. These are the people who help support those in need. I’m sick over this. BP has passed over local businesses to help out. One job in particular is the cleaning of oily boats. There’s a business right here on the coast that can do it. It’s run by a family I know. BP hired an Alaskan company to set up shop right next door. I’m sick over this. Marine life are dying. Fish, mammals, bottom feeders, plants, algae, plankton and birds are all being victimized. Pelicans, terns, gulls and other shore birds dive naturally for food. They don’t know not to dive into a blob of oil. They’re looking for food. Sharks and whales, dolphins and the like are suffocating or slowing dying from the toxic mess in their systems. Have you seen pictures of the Louisiana marshes? The plants are dead. You might still see a little bit of green on the tips but that will be gone soon. Shrimp, crabs, fish, oysters…all were spawning during this oily time. They’ll be dead or inedible for generations. I’m sick over this. I’ll be writing further about this in another post. 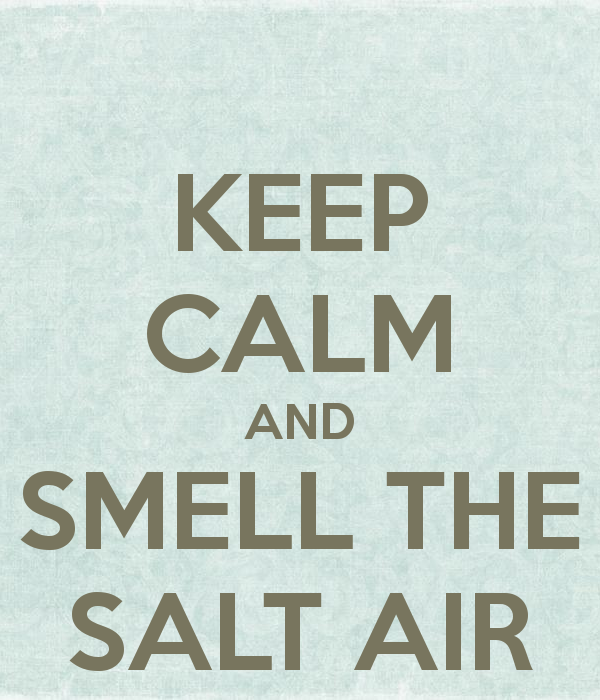 I know people that have left the area for a while because the smell was affecting them, causing headaches. We’ve smelled it a few times at my house. It’s a sickening smell. It’s much different than the smell at the gas pump. Accidents happen, even those that can be or should have been prevented, but this has gone beyone an accident to me. And, I don’t feel that the federal government really cares. They’re too busy trying to wreck the country and I guess they feel this doesn’t need their intervention. The damage is done, so they’re running around the country trying to finish wrecking the other things they’ve been working on: banking, parental rights, health care. They should be here actively getting this under control rather than leaving it in the hands of BP. Isn’t the role of government to protect and defend it’s citizens? I’m really sick over this. I love my Gulf Coast. It is home to me and lots of great people and waking up every day to find out that nothing has changed regarding the spill (except that there is more oil in the water) just leaves me with a sick feeling about our future. Our businesses, eco-system, lifestyles are all under attack and I don’t know if I’ll ever see this area back to normal. 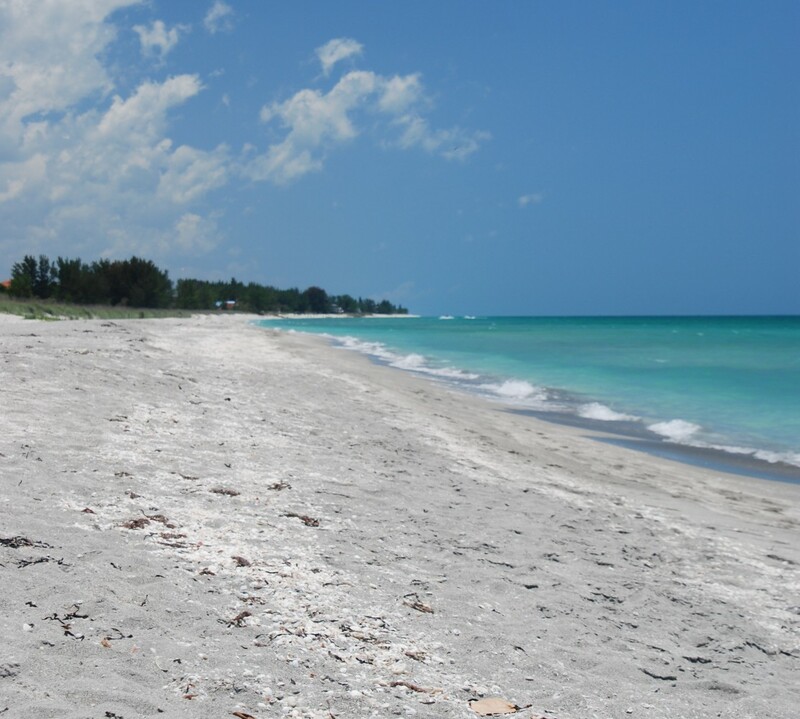 After we had moved here last year from Sarasota we explored a little but were too busy to enjoy the beach. The winter proved too cold to go down there so we haven’t been able to enjoy it as much as we expected. This was the year we made a vow to go as often as possible. I was even working on an Eco-tour business and had planned to take the Coastal Nature Guide certification class given by the Miss/Al Sea Grant Consortium through the Orange Beach Visitors Bureau. After a few trips to Gulf Shores, the oil began spilling. So instead, we got a YMCA membership so we could swim and I’m teaching art classes in my home. The surf board and beach towels are put away. I pray daily that this doesn’t go any farther along the coast but the “experts” are predicting it will be in the Keys soon and maybe Miami. Pray for our Gulf Coast.